Comets have been causing fear in the minds of humans for millennia. Now spacecraft are helping us to understand what they are made of and how they behave. The time it takes for a comet to make one complete orbit around another object is known as the orbital period. The range of a comet’s orbital period may be from a few years to hundreds of thousands of years. Short-period comets originate in the Kuiper belt, or its associated scattered disc, which lie beyond the orbit of Neptune. Longer-period comets are thought to originate in the Oort Cloud, a spherical cloud of icy bodies in the outer Solar System. 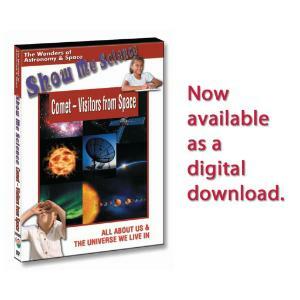 Comets allow us to study what the solar system was like in its formative period. This program will help students understand why comets cause both fear and fascination.